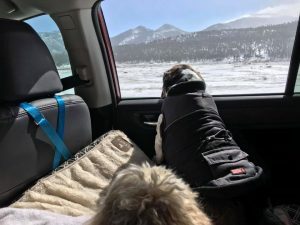 EDITOR’S NOTE: Wheeler Mayor Stevie Stephens Burden with her husband Alan and two puppy dogs recently returned from a trip across the continent. They re-discovered parts of America. Here she shares some stories about what they found and that regardless of what many believe, we are more alike from coast-to-coast than different. It is expected when you drive thousands of miles away from home to say you will get lost. It happens all the time when you are navigating your way through unfamiliar territory, even with a good GPS. As a matter of fact, for Alan and I that is the whole point of our “drives.” Admittedly, our drives are slightly more ambitious than the average. We love to explore regions of the US in our car. Driving wherever we feel pulled and allowing the country to reveal itself to us. “Let’s go get lost in American again,” he said to me about a year ago and so we did. Anyone who has known Alan and I long knows that this is not a new thing for us. 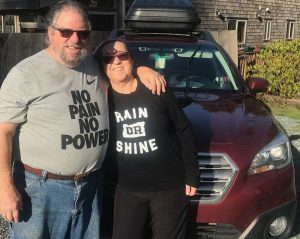 We started our first cross-country road trip two days after our children graduated from college. We had planned it as our “graduation” present to ourselves. We figured we had earned it after 16 years of participation in the public education of our two children. It had taken Alan 7 years before our first trip to convince me that I wanted to spend months in a car with him 24/7. I worried for our marriage and my sanity. 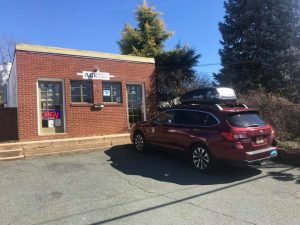 We drove the circumference of the US that first time in a purple Ford Explorer with lavender bumpers named Auber-Jean and a tent that we actually used most nights. It not only didn’t hurt our relationship, it turned out to be a pretty life changing event. And ever since that first trip, I am a total convert. Pack up the car and let’s go. I’m all in! Let’s get lost on the highways and byways of this country and see what happens. Let’s see who we meet. What people are talking about? What they are eating? What is important to them? Let’s look at geography, history, and cultures. Let’s get to know our country first hand. We have taken many versions of that trip over the last 30 years. Piling into the car with the dogs and hitting the road. Heading out into the unknown. Discovering the small out of the way places that remain truly local. 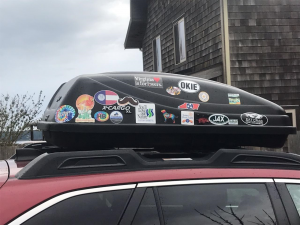 The Burdens collected stickers from their stops from the southwest to Florida, and then back again. We just finished a roughly 10,000-mile trip, 9889 miles to be exact. We took freeways and little local roads. We stayed in big cities and small towns. We ate in fancy restaurants and the most amazing local hole in the walls. And we learned a lot from the food we ate, the places we saw and people we met along the way. We met a woman who lost everything she owned in the Paradise, CA wildfires. She had been forced to relocate to Reno, NV without much more than the clothes on her back, leaving her friends and job and what was once her home behind her for the unknown. After many months of putting her life back together from the ground up, all she could talk about was how much she loved the people of Reno. How they had taken her in. Helped her get back on her feet and start over. She loved her new community and the people she had met that she now considers friends. She was fierce when she told us about not ever wanting to leave. Her gratitude toward the community for taking her in and making her feel welcome was evident, as was her determination to be worthy of that gift. America is not easy. I get that. We as individuals live in a country that guarantees freedom of speech. It does not, however, guarantee to give us everything we ask for. There is always, always compromise. There has to be in order for us to function both personally and as a country. There has to be a set of rules, laws, boundaries within which we each agree to operate. That is not an easy thing to accomplish. Change is difficult. Discord can be expected, however progress can also be expected, too. Over the course of our history as a country it is undeniable that we have made great progress. Times of strife come often and must be navigated. And despite the difficult and trying times in which we live right now, I was reminded once again of the people and places upon which our country is built. Of our resilience, our capacity for compassion, our stalwart natures, our independence and our interdependence. Our character was evident everywhere we went. 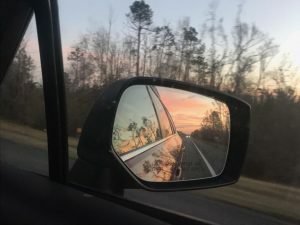 As the miles rolled on the common conversation between Alan and I became how each area and community saw things so differently than what is presented to us through the media. And I do not refer to fake news. I believe the media is doing the best job they can with the hand that these times have dealt to them. But as MSNBC would play its breaking news stories about a government that has been steeped in controversy, subterfuge, and mistrust instead of governance; we would be driving through the green rolling hills of carefully tended farm country or along the banks of rivers where fishermen plied their trades. Everywhere we went we found grace, hospitality, compassion, and just plain good folks. America still gets up every morning and does it’s part to “hold down the fort” so to speak. Farmers farm and fisherman fish, neighbors help neighbors. Differences of opinion and politics are put aside so that our communities can maintain the essential services that insure our survival as individuals and as a country. Each of us is an integral part of the puzzle, each carrying with us our piece, our role in the lifeblood of the United States. Regardless of the political times or the conflicts in our capital, each of us continues to do our job, lend our weight, and contribute to the whole in our own small ways. The America I know and love is still there. It seems to be waiting, perhaps for a spring where the seeds that have been sown will blossom into new sweeter fruit, but it is still there. Silently putting one foot in front of another to get the jobs done. Food gets to markets, goods are moved, buildings are built, and lands are tended. We are a country full of good and gracious people who are willing to put differences aside and work together towards our shared future. And I am renewed in my hope.